If you believe in the traditional view of retirement, life after 65 should be filled with trips to the golf course, martinis by the pool and plenty of TV time. Setting aside the question of whether such a life would be healthy or fulfilling, it is clear that few of us will be able to afford it. 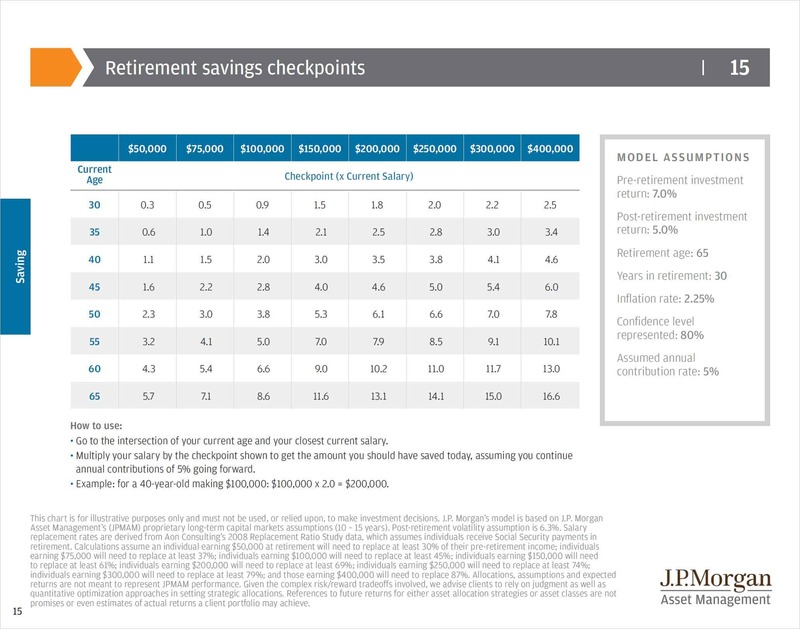 The chart below, from J.P. Morgan’s 2015 “Guide to Retirement” is a great example of how the traditional view of saving for retirement is giving us tunnel vision about arguably the most important transition in our lives. Let’s look at some of the numbers. Is the Traditional View of Retirement Realistic? If you are 55-years-old today, and your annual income is $75,000, J.P. Morgan’s model says that you should have saved $307,500 for retirement already. In addition, you will need to save an additional $225,000 over the next 10 years. Yes, compound interest on your existing investments will help, but, it’s still a big number. Given the fact that, according to this separate report, 60% of people aged 55 have less than $100,000 in savings, it’s clear that our generation has a big problem. Take a few seconds to look up your own numbers and then let’s get back to the discussion of whether we need to rethink retirement. Before I explain why we need a new way of looking at retirement, let me be clear that saving should still be a priority for baby boomers. If you aren’t contributing to your 401K and putting aside as much as you can for your life after 65, stop reading this article and get your financial house in order. That said, there are plenty of reasons to think that, for the majority of people, saving for retirement simply won’t be enough. So, what’s the alternative? For starters, we need to stop thinking of 65 as a magical age at which we will be able to stop working entirely. For the majority of baby boomers, continuing to work past “retirement age” makes perfect sense. This is not just a matter of money; working is one of the best ways to keep your mind healthy and maintain your social connections. If you want to reduce your hours, start a company, or switch to a new job that you find more fulfilling, go for it! But, for most people, the idea that retirement should be a time of quiet relaxation and “aging gracefully” is entirely outdated. Are You Saving Enough Skills for Retirement? At this point, I’m sure that many of you are thinking, “That’s all well and good, but, I may not have a choice when I retire.” Ageism in the workforce is a big problem. This is, in part, another unfortunate side-effect of the way that we look at retirement. Many companies still believe that people should retire at age 65, even if they don’t force them to do so. As a result, many boomers find their careers slowing in their late 40s and 50s and may even be asked to leave. One solution to this problem is to start building the skills that you need today to support yourself as an independent contractor or business owner tomorrow. In other words, don’t just keep track of how much money you have saved. Keep track of the skills you have acquired. Don’t just plan how you will budget your money in retirement. Plan how you will add value to others if you are forced to go it alone. We need a new way of thinking about retirement – one that recognizes the fact that we are living longer, healthier lives than ever before. We need to recognize that retirement is not a destination. It is a new phase of life, with its own challenges and opportunities. Our generation has so much to contribute. Let’s get out there and show the world what we can do! Do you agree or disagree that the traditional concept of retirement is unrealistic for the majority of people? Why or why not? Would you like to continue to work after age 65? If so, would you like to continue with your current career or try something new? Please join the discussion.